Whenever we buy a new appliance, an electrical appliance, we don’t tend to ask about its safety act regulations. Any safety act regulation is set up by the government for the safety of consumers. The same goes for refrigerators. The refrigerator safety act has been set up by the government to make sure that the consumer and the makers both know the rules regarding this big kitchen appliance. To ensure the consumer’s safety for every feature of the refrigerator, different rules have been set to ensure that everyone’s safety has been taken care of when they use the refrigerator. The Refrigerator Safety Act was enacted by the U.S Congress in the year of 1956 to address companies to add a magnetic latch to the refrigerator doors. The magnetic latch is needed to make it possible for the refrigerator doors to be opened from the inside. This begs the question why, but who knows accidents do occur from time to time. This rule by the government also makes it easy for anyone to open and close the refrigerator door. As we all know refrigerators can be very heavy, but the doors have been made in such a way that opening and closing the refrigerator won’t be difficult at all. 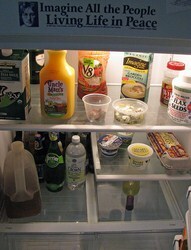 Below you will find all the information you need on the refrigerator safety act. Refrigerators did not have any sort of safety mechanism installed in its doors before 1956. Before The Refrigerator Safety Act was enacted, children would often become the victims of bad accidents when it comes to dealing with refrigerator. They would find old and abandoned refrigerators and hide inside while playing with it during their playtime hour. The children will eventually die from suffocation because there is no way for them to open the refrigerator door from the inside once they are in. The act set up by the government has made sure that all of the new refrigerators should come with a safety latch installed in the doors before entering to the market. The Refrigerator Act was also made illegal for the manufacturers to introduce any refrigerator to the market that was manufactured prior to the date specified and was not installed with the magnetic latch device. Section 2 on the act stated that anyone who delivered a refrigerator in violation of the act would be guilty of a misdemeanor. The person could be sent to prison for a year or less and will be fined for no more than $1,000. The section was then amended to a fine of $200,000 if the violator did not result in a death and if any death is occurred, the violator will be fined for $500,000. These days when you purchase your own refrigerator, you will have nothing to be afraid of as most of these new refrigerators in the market abide by the rules setup by congress. But in case you do come across any kind of cheap refrigerator that do not follow the rules setup by congress then it is better to report the refrigerator to the government. This entry was posted in Home Improvement on November 26, 2011 by Mike.